Balsam Copaiba essential oil is a great oil to use for pain of any kind. It is also great to use for respiratory issues, because of the b-caryophyllene content. Copaiba trees grow from 50-100ft high. C officials occurs widely throughout South America, including the Amazon. The tree produces many small, white flowers. The resin accumulates within the tree trunk. A single copaiba tree can provide about 40 liters of resin annually, making it a sustainable rainforest resource that can be harvested without destroying the tree or the forest in which it grows. Indigenous tribes use copaiba resin topically as a wound healer, to stop bleeding, for skin sores and psoriasis. 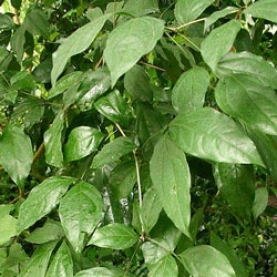 In Brazillian herbal medicine, the resin is used as a strong antiseptic and expectorant for the respiratory tract (including bronchitis and sinusitis), as an anti-inflammatory and antiseptic for the urinary tract (for cystitis, bladder and kidney infections). In the United States it was an official drug in the U.S. Pharmacopeia from 1820 to 1910. Balsam Copaiba essential oil, as with many of the resins, is energetically helpful in healing old wounds or traumas. There is a calming, centering effect felt just from the aroma. It can be used in meditation and for any time when the nervous system needs balance and harmony. The ancient vibration from the is oil helps us to remember pieces of our own ancient DNA. Any time there is a need for rebalancing with ease, Balsam Copaiba will help this to be accomplished. Balsam Copaiba essential oil contains a significant percentage of b-caryophyllene that carries anti-inflammatory, analgesic and anti-spasmodic benefits. B-caryophyllene is known to be antiviral and have immunostimulant properties. There has been some animal research that shows b-caryophellen and a-humulene to have some anti-tumoral benefits. Add to 1oz of unscented lotion & apply as needed. There is no known safety concern for Balsam Copaiba essential oil.